Novembr 27, 2018, I spotted two tough little Eastern Black Swallowtail cats munching on a lone fennel plant, left in a cleared out bed at the Williamsburg Botanical garden. Eastern Black swallowtails lay their eggs and their larvae feed on parsley and fennel. This bed was filled with Lantana, Salvia, and with fennel all summer, and hosted many butterflies from May until November. Butterflies covered this planting of Lantana at the Williamsburg Botanical Garden in August. When I told my friend Judith about the caterpillars, she came and rescued them the afternoon before a hard freeze, at the very end of November. Judith cared for the caterpillars until each formed its chrysalis, feeding them organic parsley in little habitats indoors; then she added them to her collection of living chrysalides. She cared for the sleeping caterpillars all winter and brought them over to our garden yesterday morning, just as they were ready to leave their chrysalides as butterflies. She named the two caterpillars rescued from the fennel at the botanical garden ‘Rough’ and ‘Tough’. They spent the winter pinned to this Styrofoam in her butterfly habitat. A total of three Black Swallowtail butterflies emerged during her visit yesterday morning. She generously set all three free in our garden. There were two males and a female. The amount of blue on the hindwings is the main way to distinguish gender in these swallowtail butterflies. Here Judith is releasing the first of the butterflies, a female. Then she invited us to help release the other two butterflies into the garden. The butterflies need some time for their wings to fully stretch, dry and toughen before they are ready to fly. We were able to hold and observe them as they prepared for their first flight. Would you like to attract butterflies to your garden? The first step is to plant a variety of both nectar plants and host plants. Nectar plants attract butterflies, and host plants allow them to lay their eggs and will feed the larvae as they grow. If you attract butterflies and host their larvae, it is important to commit to not using insecticides in your garden. Yes, the larvae will eat some leaves on their chosen host plant. The plants will survive. Fennel and parsley host several types of swallowtail caterpillars. Other easy to grow host plants include oak trees; spicebush, Lindera benzoin; paw paw trees, Dutchman’s pipevine, Aristolochia macrophylla; passionfruit vine, Passiflora lutea; and even common wood violets. Most butterflies prefer very specific host plants and may only use one or two. For example, Monarch butterflies want Asclepias, or milkweed. There are several different species of Asclepias available, and most all of them will support Monarchs. It is useful to do a little research on common butterflies that live in your own region, and then plant their host plants, if you don’t have them growing on your property already. This was the last of the three butterflies to emerge from chrysalis, and the last to be released. He wasn’t ready to fly, and so we gently placed him on this red bud tree, where he rested while his wings hardened. Finally, he also flew away into the garden. Butterflies need safe places to shelter out of the wind at night and during storms. Trees and dense shrubs serve them well. They also need places where they can ‘puddle,’ landing on the ground to drink water from mudpuddles, moist earth, or even shallow saucers filled with gravel and water. Butterflies need the minerals they absorb this way. Butterflies will feed from a variety of nectar plants, including trees, vines, and flowering plants you may plant in baskets, pots or beds. Lantana is an absolute favorite source of nectar. Agastache, anise hyssop, attracts even more butterflies than Lantana! All Verbenas attract butterflies and are very easy to grow. The more flowers your garden offers, at a variety of heights, the more butterflies will likely stop by to visit your garden. There are many butterflies and moths native in Virginia and all of them are currently in decline. We have a network of dedicated butterfly enthusiasts in our area who rescue and raise cats, releasing the butterflies into the wild as they emerge. By protecting the butterfly larvae, they help insure that more individuals make it to the adult butterfly stage, mate, and increase the population. One of the greatest problems faced by butterflies is loss of habitat. The native plants they depend on to raise their next generation are often the ones removed for development, but not replanted by landscapers. Gardeners can make a significant difference by providing a small bit of habitat in their own yard. Like a patch in a quilt, our own bit of habitat may be small. But, when many of us are all working together, we can provide safe places for butterflies to rest and refuel along their migration routes, and can provide safe and welcoming places for them to lay their eggs. By working together, each of us providing a bit of habitat and safety for butterflies, we can help support the next generations of butterflies; making sure that our own grandchildren can enjoy these beautiful insects and share their magic with their own children, far into the future. An Eastern Tiger Swallowtail feeding on Verbena bonariensis ‘Lollipop’. Chipped up wood and leaves spread over a foundation of bark, roots and branches will rot into good compost over time. I spent far too many hours of my youth watching Mark Knopfler and Gordon Sumner sing, “I want my money for nothing, and my chicks for free!”. MTV was brand new in those days, and I was utterly fascinated by the up-close view of the artists performing and the dreamy vignettes hyper-produced to sell their tunes. Fun fact: Gordon Sumner, better known as Sting, co-wrote that tune with Knopfler. A former teacher, Sumner’s music career was just taking off as I began my own classroom teaching years. He inspired me…. These were the days when Ted Turner was still trying to prove his idea that the public would support 24/7 journalism as entertainment over at his new CNN cable channel, and I was still living in a tiny walk up city apartment with only a few potted plant to soothe my achy, throbbing thumbs. The world was filled with delicious possibilities. Well Knopfler and Sumner have aged, while I have not. They still perform and I happily preside over our little Forest Garden. They may have become unimaginably wealthy, but I have learned how to get fertilizer and plants for free! I’ve left my classrooms behind, but will happily teach you how to perform the alchemy of soil for yourself, if you care to know the secret. The world remains filled with delicious possiblities! It is all in how you look at things. You probably understand that simple, but profound statement from your own experiences. What seems free from one point of view, becomes costly from another. What at first appears costly, ends up providing many more side benefits than expected. Let’s take fertilizer as an example. Yes, I admit to the bags of Plant Tone, Rose Tone, Holly Tone, Bio-Tone Plant Starter With Mycorrhizae and a precious little jug of Neptune’s Harvest wintering in our garage. Then there is the jar of Ozmocote, and the secret stash of crystallized orchid food hidden under the kitchen sink; a snack for when I want to coax the cohort of potted plants in our living space to bloom. No, none of those were free. In fact, if you added up what I spent on all of them combined, they would likely buy a nice new pair of work boots…. And that was not the only ‘cost’ involved in these plastic bags and bottles of plant nourishing products. They all came from factories. Many of the ingredients were mined out of the earth. Although these are ‘organic’ formulations, huge amounts of energy were invested in harvesting their components, creating the fertilizer, packaging it and transporting it to our local shops. After the product is used up, there is some contaminated plastic packaging that won’t decay and must be put somewhere. Those are costs we don’t see, and ones rolled into the price we pay. Gravel and Plant Tone ready to be mixed into the bottom of the planting hole. Now, if I use too much or time my application incorrectly, a lot of that product will simply wash away from my garden and into the creek. Fertilizing our waterways increases algae growth and upsets the chemistry of the natural waterways. Run-off of fertilizers has a profoundly negative effect on our lakes, rivers, the Chesapeake Bay, and even the oceans. Phosphorous, the P on your fertilizer bag, has an especially damaging effect when released into the waterways. It initially stimulates the growth of algae and other plant life, which eventually shades out plants living on the bottom. As this overabundance of plant life dies and sinks to the bottom and decays, it ties up oxygen needed by animal life, and destroys their food supplies. Which is ironic. Phosphorous is essential to plant growth, remains a key component of all commercial fertilizers, and is in limited supply. Experts predict that our known supply of rock phosphorous that can be mined for industrial use will run out before 2200. Phosphorous is present in living tissue, and so may be found in urine and bone. You may have heard about the ancient gardeners using human urine to fertilize their gardens. This practice is discouraged today, of course. But recall that animal waste products remain an essential ingredient in agriculture around the world. Many of the ‘organic’ fertilizers contain rock phosphate or bone meal as essential parts of their formula. Phosphate in the soil isn’t always readily available to plant roots. It must go through further biochemistry to make it available, and this happens best in living soil filled with microorganisms. It happens best when the soil’s pH remains between 6.5 and 7. Potassium, the K on your fertilizer package, is formed in supernova explosions. It is both a metal and a salt. In its pure elemental form, it reacts violently with both water and oxygen. It is an extremely common element on earth, is found in all living things, and is an essential part of the biochemistry of all life. Potassium in fertilizers appear as potassium chlorides, sulphates or nitrates. How is the average gardener to know whether or not their soil’s pH will even allow the plants access to any available phosphorous, nitrogen or potassium, and whether any additional nutrients are needed? That is why a soil test can give us invaluable information about our soil, and how to make it better. Any local Extension office will gladly help with kits, instructions, processing and interpreting your soil test, and all states offer this service at a modest cost. Knowing what nutrients your soil may lack, to grow specific types of plants, allows a gardener to add only what is truly needed. We can stop over-fertilizing, or adding fertilizer that never becomes available to our plants because of the complex chemistry of our soil. Most experienced gardeners will tell a newbie: “Feed your soil, not your plants.” At first, this makes no sense. But as you begin to understand the complexity of the soil as a living organism, it makes perfect sense. Good soil is alive! It is alive with microscopic bacteria, fungi, and tiny invertebrate animals that continually recycle Earth’s elements and make them available to fuel new growth. Although some part of the soil is made up of tiny grains of mineral like sand, or granite, or clay; a large part of good soil is composed of decaying organic matter. Soil is alive, and improves as you add organic matter each year. These may be decaying roots or leaves, dead ants, or compost you’ve made from kitchen scraps. It may be animal manure or even animal remains. It may be a cover crop turned into the soil, bark mulch, hay or grass clippings. Anything that once lived may eventually feed the soil. And because all of these things contain the elemental building blocks of life, as they decay, their chemical components are released for re-use. In addition to the big three of nitrogen, phosphorous and potassium, plants need many other elements and trace minerals naturally found in good, active soil. We can re-charge our soil with the nutrients necessary for plant growth in several ways, without having to purchase plastic bags filled with commercial fertilizers. 1. Grow and compost plants with deep roots. Certain plants grow especially deep roots, which means they can access and absorb minerals deep into the soil, far below the area we cultivate. As they grow, these minerals are stored in their plant cells. Harvesting and then composting these plants enriches our soil. Consider growing plants such as alfalfa, comphrey, parsnips and other root vegetables, purple coneflowers, and dandelions. Trees with deep taproots also absorb minerals, which are stored in their wood and leaves. Comphrey’s roots extend for several feet into the soil, mining minerals that are stored in leaves and stems. Comphrey attracts pollinators, is a medicinal herb and a great addition to compost. Also use it as mulch around plants that need a boost. 2. Encourage earthworms. Earthworms eat and digest organic material, and their droppings enrich the soil. This greatly speeds the decomposition process and makes nutrients available to plant roots much faster. Worm casting also contain beneficial microbes that work with plants. Worms also loosen the soil and aerate it as they move around. Worms will come to the surface to eat, but will also tunnel to a significant depth as they go about their lives. Organic matter left on top of the soil attracts earthworms. Worms will feed at the surface, so long as it is deeply shaded, but live below ground. 3. Sheet compost over areas you plan to cultivate. Sheet composting simply means laying organic materials directly on the soil where you want them to decay. This organic material attracts earthworms and other decomposers to live and eat in this area, enriching it. All organic mulch, whether straw, grass clippings, chipped leaves, bark, seaweed, coffee grounds, tea leaves, kitchen scraps, egg shells, sticks and branches or alfalfa pellets may be considered components in sheet composting. I like to lay brown paper or black and white newsprint over the area first, establish the borders, and then pile materials in a ‘sheet’ over an area I intend to use later for growing new plants. 4. Grow plants that fix nitrogen in the soil. All plants breathe. Plants inhale through tiny holes in their leaves and use elements in the air, such as carbon and nitrogen for their growth. When they exhale, they release oxygen and water vapor back into the environment. Once plants have inhaled carbon, it is fixed into the walls of each cell. But some plants are able to store nitrogen on their roots. All members of the pea or legume family, Fabaceae, fix nitrogen, the N on the fertilizer bag, on their roots. This nitrogen enriches the soil, and often may be used by plants growing nearby. Fungi living in the soil assist with the transfer of soil nutrients and water between plants. Native Wax Myrtle fixes nitrogen from the air on its roots, making the area around each shrub more fertile with each passing year. Plants growing nearby can use this nitrogen, thanks to fungi in the soil which help transfer nutrients and water between plants. Fallen leaves also further enrich the soil. Members of this family include crops such as peas and beans, peanuts and lentils. But it also includes flowers like lupines, and several shrubs and trees like black locust, acacia and mimosa. I recently learned that the wax myrtle also fixes nitrogen on its roots, enriching the soil. Our native redbud, Cercis canadensis, also fixes nitrogen on its roots, enriching the soil for plants growing nearby. It is a member of the Fabaceae family, and its seed pods may be eaten. This seedling can eventually grow into a small tree. Planting, or allowing, plants to grow that ‘fix’ nitrogen in the soil enriches the soil with that most necessary element for good plant growth- Nitrogen (N)- for free! Nitrogen, always present in the atmosphere, can be captured and packaged by plants in our garden, and kept at root level, available to all that need it and naturally enriching our garden’s soil. Clover growing in the lawn is also fertilizing it. In addition to feeding pollinators and small mammals, clover fixes nitrogen along its roots. Here is a partial list of plants that perform this little miracle: all clovers, sweet peas, vetch, bush clover, Wisteria, golden chain tree, Judas tree, honey locust tree, Kentucky coffee tree, alder, some roses and many members of the gourd family, such as squash and pumpkins. Native Wisteria frutescens growing at the Williamsburg Botanical Garden fixes nitrogen in the soil along all of its roots. If you can plant food or flower bearing plants, which also fix nitrogen to improve the soil, you have multiplied this natural wealth for your own use. Nature’s gifts surround us. The more we understand about the living ecosystem we inhabit, the more we can work cooperatively with our environment to cultivate and enrich the web of life. The more we learn, the more we can disengage with costly commercial suppliers, and find ways to accomplish our goals in harmony with nature. A beautiful Buckeye butterfly enjoys sweet Lantana on a warm, October day. “Butterflies can’t see their wings. it requires quick wits, good eyes and desire to net them. And once you have them, you need to act fast. An idea, like a butterfly doesn’t last long: it is ephemeral. “Hope can be a powerful force. “Fairy tales do not tell children the dragons exist. Children already know that dragons exist. is to get up and do something. Don’t wait for good things to happen to you. You may count gluttony among those seven deadly sins, but our little Swallowtail didn’t get the memo. She was covered in so much wonderful sticky pollen by the time we spotted her, that we aren’t quite sure whether she is an Eastern Tiger Swallowtail or an Eastern Black Swallowtail. Since no white spots are visible on her body, we suspect that she is the black form of the female Tiger Swallowtail. From my perspective a bit under her, while she enjoyed this rose of Sharon flower, it looked as though she was lying on the flower’s pistol, straddling it with legs akimbo. You can see the pollen on her body, legs and even wings. These rose of Sharon flowers, Hibiscus syriacus, must be enticingly delicious. We watch the hummingbirds stop by these shrub several times a day. Other, smaller butterflies and bees flew in and out and around while our Swallowtail feasted. These beautiful trees are easy to grow in full to partial sun and reasonably moist, but well-drained soil. They self-seed readily and grow with little attention from a gardener. We let them grow in several places around the garden because they are so beloved by our pollinators. You will find many different rose of Sharon cultivars on the market. We’ve found many different ones growing around our garden, with new seedlings showing up every summer. Rose of Sharon trees begin to bloom when they are just a few years old. We may lose a tree or two a year, as they aren’t very long lived and grow on fairly shallow roots. The largest one in our garden tops out at less than 20′ tall. This is a good landscaping tree that won’t endanger foundation or roof if planted close to the house. Growing it near a window provides hours of summer entertainment as the pollinators come and go. Although it’s not native to Virginia, Hibiscus syriacus has naturalized here, and fills an important niche in our summer garden. It is both beautiful and generous, and we enjoy watching the many winged and wonderful creatures that it attracts throughout the year. Eastern Black Swallowtail larvae feast on our bronze fennel. Hummingbirds are much smarter than we want to consider. They would have to be. How else would they know to buzz in for a sip of nectar when my camera is out of reach? The first of the morning zoomed by to visit a basket Verbena and Lantana flowers warmed by early morning sunshine on our deck. I’d gone out with the cat to water first thing, before the day’s heat had a chance to build. Even had I brought the camera out with me, the little guys would have likely buzzed away again before I could even turn it on. They are independent minded like that! I heard their comings and goings a bit later in the garden. My attention was focused on some late season planting and mixing up snacks of fish emulsion for the pots, and I was too busy to fumble off my gloves and pull the camera from my pocket. The hummers could care less; they were systematically sampling the morning’s offerings of nectar. One lit on a branch to watch the car pull away while the other made a dash for the Lantana patch that grows by the street. Their message was clear: they would watch over the place while we were away. A female Eastern Black Swallowtail butterfly enjoyed nectar from Lantana last Sunday afternoon. A new friend asked me over the weekend whether I photograph many birds. Questions like this leave me a bit on the defensive. I’m not much good with birds, especially with hummingbirds. I’ve taken maybe five good photos of hummingbirds over the past several years. They always seem to take off before I can get my camera out and on and focused on them. They seem to have a sixth sense about when I’m paying attention to them, and quickly lift up and away. Maybe I should set an intention to capture more bird photos in the weeks ahead. The big ones, like eagles and herons are slow and patient enough for me. I’m always happy to snap their portraits. It’s the fast little ones that I’ve not yet learned to charm into posing. So now you know the real reason why I’m thinking and writing about hummingbirds, while sharing photographs today of caterpillars. Caterpillars make easy targets for a novice wildlife photographer. They are so entirely focused on stripping the vegetation from the fennel that they pay me and my curious camera no mind. These beauties are Eastern Black Swallowtail larvae, and they enjoy a variety of host plants related to herbs in the carrot family. They love parsley and dill, fennel, Queen Anne’s lace, and wild parsnip. I counted four individuals on a single fennel plant this afternoon, after finding only a single cat munching away yesterday. Eastern Black Swallowtails may produce three generations over our long summer. Depending on the weather and the host plants, an individual may develop from egg to adult in 40-60 days. The final generation of the summer may overwinter here as a pupae. This beautiful butterfly may be found in Eastern and Central North America from Southern Canada south to Northern Mexico. We don’t mind them munching the herbs. We plant the herbs in hopes of attracting them and keeping them returning to our garden. Besides, the herbs are tough, and will send out new growth so long as we keep them hydrated. How many cats can you spot on the fennel? They blend in very well. That may sound like a strange thing for a gardener to say. But as much as I admire the beautiful plants in our garden, it feels very lonely and empty without the hum and buzz and movement of the many animals who share it with us. The garden is like a living stage; and it’s the animals, even the insects, who bring the drama to life. that they depend on is being destroyed. Our hummers love this Salvia ‘Black and Blue.’ Goldfinches love the black eyed Susans. We’re willing to sacrifice the herbs in hopes of enjoying the butterfly adults! We plant lots of nectar plants to occupy the butterflies (and hummingbirds) while we enjoy them. That said, I couldn’t find a single butterfly when I was out with the camera in late afternoon. My partner said he saw a big yellow Tiger Swallowtail, that I missed. A male Eastern Tiger Swallowtail enjoying the Joe Pye Weed last week. The best I could capture on this Wild Life Wednesday was a tiny dragonfly, a large bumblebee, some unknown bugs on an Iris seedpod, and this family of swallowtail cats. That’s OK. I know they’re out there, and that means the garden is a refuge and delight for many amazing species. Native Hibiscus will open to welcome all hungry pollinators tomorrow morning! It was just a little goldfinch. Yet I was so delighted to notice it gracefully balanced on a yellow black-eyed Susan flower near the drive, when we returned from our morning errands. He concentrated his full attention on pecking at the flower’s center. Though the seeds aren’t yet ripe, he was clearly hoping for a morsel to eat. Once I took a step too close, he lifted into the air on outstretched wings, disappearing behind a stand of goldenrod. ‘Green Envy’ Echinacea mixes with basil and more Rudbeckia, a feast for goldfinches and butterflies. Goldfinches and cardinals catch our eye with their bright feathers, but there are all of the other grey and brown and occasionally blue birds flitting from grass to shrub and flowering mass from before dawn until their final songs long past dusk. And then we listen for the owls’ conversations through the night. I heard a wonderful speaker yesterday morning, who pulled back the curtain a bit on the world of insects in our gardens. He is a former student of Dr. Douglas Tallamy, author of Bringing Nature Home , and is now an assistant professor of Biology at nearby Hampton University. Dr. Shawn Dash is a gifted teacher, keeping us all laughing and learning as he shared his insights into the importance of the insects of the planet in maintaining the web of life. Joe Pye Weed attracts more insects than any other flower in the garden this month. I am a total novice in this mysterious world of insects. But I will say that I am learning to look at them with admiration and respect… so long as they remain out of doors in the garden! Joe Pye Weed is the best wildlife attractor blooming in our garden at the moment. It is simply covered with every sort of wasp and bee and butterfly and moth and sci-fi ready insect you can imagine. The ‘buzz’ around it mesmerizes. Our garden hums and buzzes and clicks with life as July finally melts into August. Dr. Dash talked about the musical chorus of insects as one of the wonderful benefits of a full garden; a diverse garden that includes some percentage of native plants to support them. Creating a layered garden with an abundance of plant life from the hardwood canopy all the way down through smaller trees, shrubs, herbaceous plants, vines and ground cover offers many niches to harbor a huge array of insects. All of those juicy insects attract song birds and small mammals, turtles, frogs, lizards and yes, maybe also a snake or two. A fairly sterile suburban lawn may be transformed into a wild life oasis, a rich ecosystem filled with color, movement and song. And the whole process begins with planting more native trees and shrubs to offer food and shelter to scores of species. But even more fundamentally, the process begins when we value the entire web of life in our particular ecosystem and allow it to unfold. Hardy blue mistflower, Conoclinium coelestinum, grows wild in our garden. I stopped weeding it out after a few plants survived deep enough into the summer to bloom with these gorgeous blue flowers. I quickly learned that I don’t really need to go out and buy a lot of native plants. I only have to allow them to grow when they sprout from the seeds already in our soil. I have to allow the seeds that wildlife drop in our garden to have a bit of real-estate to take hold. And nature magically fills the space. We guide, nurture, and yes edit. But as soon as we allow it and offer the least encouragement, nature becomes our partner and our guide. The goldenrod want to claim this entire area as their own… time to give some to friends! 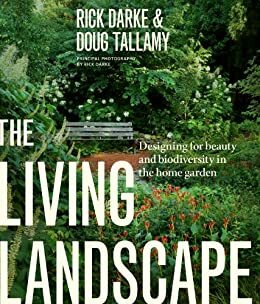 If you’ve already read Bringing Nature Home, let me invite you to also read, The Living Landscape: Designing for Beauty and Biodiversity in the Home Garden, co-authored by Dr. Tallamy and landscape designer and photographer, Rick Darke. This translates the science into the practical planning of an ecologically balanced home landscape, and is richly illustrated and laced with wonderful stories. It inspires one to go plant something and make one’s garden even more diverse. Our little Eastern Black Swallowtail caterpillar is growing fast, happily munching on the Daucus carota. Our garden is filled to overflowing, this Fabulous Friday. It is filled with flowers and foliage, birds, squirrels, butterflies and scampering lizards. Our garden is filled with tweets and twitters of the natural kind, the sounds of wind blowing through the trees and rain dripping on the pavement. Our world is wet this week, as storm after storm trains up the East Coast. I’m grateful for the rain even as I’m swatting at the mosquitoes biting any exposed bit of skin, while I focus my camera on the butterflies. I hope that your summer is unfolding rich in happiness and beautiful experiences. I hope you are getting enough rain, but not too much; that your garden is doing well and that you are, too. Happiness is Contagious; Let’s Infect One Another!